Turpentine balm: 30% cedar resin, 10% mumijo, in cedar nut oil, 100 ml bottle. Weight: 200 g per item. Siberian cedar is common name for Pinus Sibirica. Resin in turpentine balm accelerates upto 10 times the metabolism in the human body. 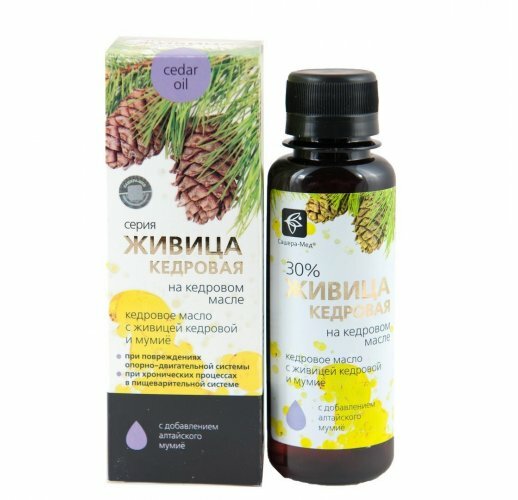 Cedar nut oil in turpentine balm serves as regeneration by providing cells of the body all the necessary material for reconstruction and renovation. It is recommended at musculoskeletal system disorders (pain in the back and joints, impaired motor activity, fractures, sprains, bruises, hematomas), metabolic processes. For harmonious recovery of musculoskeletal tissue, elimination of pain symptoms without the use of synthetic analgesics.